Universal Robots – a leading manufacturer of industrial collaborative robot arms, or “cobots”, based in Odense, Denmark – will be exhibiting at Future Robotics on Tuesday 13 November at The Slate, Warwick University. 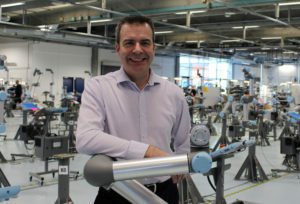 The company cites its mission is to increase productivity, as well as ensure the safety of workers in all industries by providing highly customised cobots to help with the most dull, dirty and dangerous tasks – leaving the more stimulating and rewarding responsibilities for human employees to focus on. Its cobots are designed to work alongside humans and are easily customisable to changing tasks, making them ideal companions for busy factory life. “Small and medium sized manufacturers haven’t traditionally looked at automation as a solution to their challenges. However, we know that when people get hands-on with our cobots they instantly understand how they could benefit by incorporating them into their operations. Universal Robots recently introduced its new flagship e-Series line of collaborative robot arms, as part of the mission to bring the benefits of automation to companies of all sizes, in all industries. The new e-Series builds on the original cobot, with six articulation points and a wide scope of flexibility. Designed to mimic the range of motion of a human arm, the e-Series enables faster development for a wider variety of applications, offers easier programming than ever, and meets the very latest ISO safety standards. All Universal Robots cobots are supported by the UR+ ‘app store for robotics’, which provides easy access to a wide range of approved partners’ grippers, end-effectors and accessories. They can therefore be customised for a variety of scenarios and applications. All products are tested and approved to perfectly integrate with the robot arms, ensuring quick set-up, reliable operation, simple programming and a smooth user experience. Delegates will be able to visit the Universal Robots stand and get a hands-on experience with cobots and technologies from a wide range of UR+ partners. Gray continues: “Users can simply walk up to one of our cobots, grab a touchscreen, follow the interactive user interface and within two minutes they will have mastered their first robot move. We want our visitors to get a practical understanding of how the cobots work and just how easy they are to operate.